For my very first post (other than the tutorial), I chose to show you possibly the best gradient I've ever done in combination with a How To! 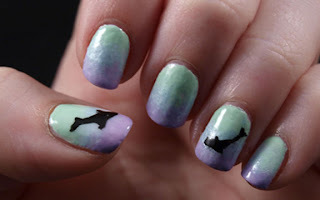 For this look I used a base coat of Wet n Wild White Creme, SH Lacey Lilac, SH Mint Sorbet, NYC Cashmere Creme for the gradient, Wet n Wild Black Creme for the dolphin, and topped it off with one coat of Seche Vite. For the dolphin tutorial click here.